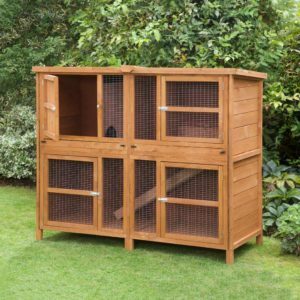 If you have a big rabbit that needs some extra space or if you have an energetic rabbit who just loves to run around then our 5ft hutches are for you. 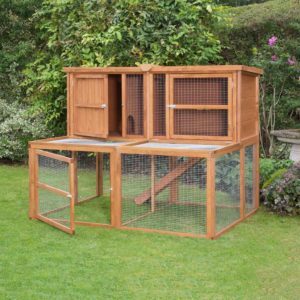 We offer a range of luxury hutches so if you’re looking to give your bunny some special treatment, then you know you can count on us to give you what you need. Our variety of hutches offer things like ramps, waterproof floors and many other rabbit friendly amenities. This makes it easier than ever to keep your furry friend entertained. All our hutches are all built to keep your rabbit safe and healthy. Our hutches have integrated legs to lift them off the floor. This promotes airflow, stops the rot and keeps your bunnies feet dry in case of standing water. Each hutch also has a private area for your rabbit to hide and sleep. This helps your rabbit feel safe and allows them to better manage stress. All the wood is treated with animal safe preservatives so if your bunny decides to chew on the cage it will not do them any harm. The larger hutches also allow for more activity and an active rabbit is a healthy rabbit. Our hutches are also designed to protect your rabbits from predators. The wired doors and centre panels use mesh smaller than 1 inch so nothing can reach into the cage. The hutches are built to be tough to help keep foxes and badgers that may take an interest at a distance. 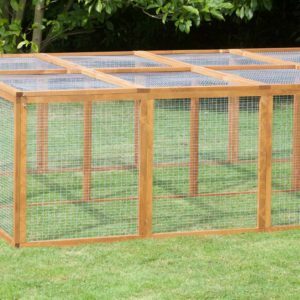 All our runs also come with wired mesh roofs to prevent birds of prey from getting in and your pets from hopping out. 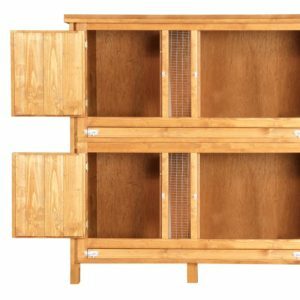 People who own several rabbits will love our 2 tier 5 foot hutch. 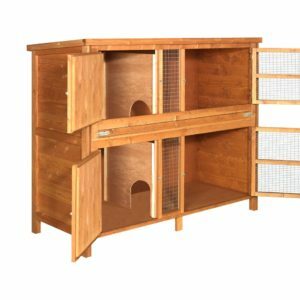 It has two separate areas, one on top of the other, so you can give your bunnies their own space while still only having one hutch. Each level has an open area with a handy wired front section for attaching water bottles and hay feeders too. The non-private area part of the floor can be used to house food bowls and toys, also giving your pet room to move around playfully. The cosy sleeping area is separated by a divider and is perfect for some quiet time or bedding down at the end of a day. The other has a screen front for fresh air and to allow your rabbit a good view. 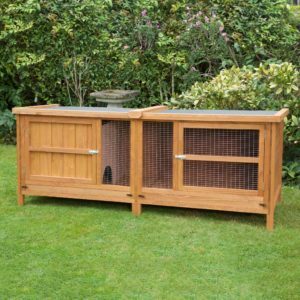 If you have one big rabbit or some babies (kits) and want to give them some luxury, our double luxury hutch is ideal. The Double 5-foot enclosure has two levels with a ramp connecting them. Half of the upper level is fully enclosed to offer your bunny some privacy and the rest has wire mesh doors and two central wired sections to attach accessories. This means your rabbit has lots of room in their hutch to play and relax. 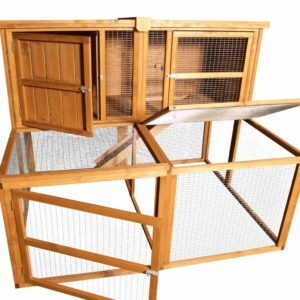 If you need a rabbit hutch that does not obstruct views or has height restrictions, our single level 5 foot rabbit hutches are perfect. They provide plenty of space while remaining inconspicuous. This hutch is also perfect for anyone with a small garden. Pet owners who want the safety of a secure home and access to their garden should consider the 5-foot hutch and under run combo. 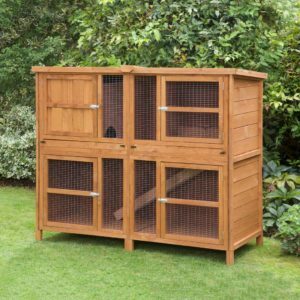 This provides your rabbit with the security of a well-built hutch and the freedom to explore the grass underneath. The two are connected by a ramp, giving your rabbit space to exercise and play with a secure home attached. 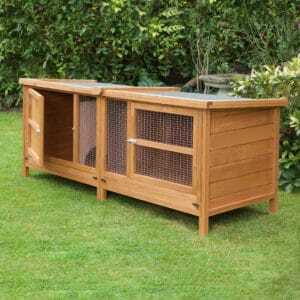 Our rabbit hutches can also be used with our hutch huggers as well as our range of Hutch Accessories. Home & Roost has everything you’ll need to accessorise your hutch, keeping your furry members of the family dry and warm during the winter months. Home & Roost deliver quality hutches and accessories to your door with our super fast delivery system and flexible delivery options. All of our 5ft hutches come with an easy assembly system and you could have yours up and running in minutes. Get In touch today and let’s talk about your pets new home. Contact Home & Roost to see what we have in store or speak to a member of our team today. Alternatively, you can view all of our rabbit hutches. We’re always on-hand and happy to chat about our hutch designs and our huge range of accessories.